A strange detail: the third bar is highligthed, but this is the bar that represents the value of the Netherlands, not the fourth bar of Belgium. The Minister most probably borrowed this graph from someone who researched the rank of the Netherlands in the EU (probably from this tweet). It is a bit confusing to see the third bar highlighted when the statement is about the fourth (not highlighted) bar. Going down in the conversation, it appeared that by “at the top” the Minister meant “within the top 5 or even top 10”. That top is the fourth place when considering … “MWh wind energy per km2“. So apparently he is talking about electricity consumption in the EU (not “Europe”). Also here, don’t be distracted by the red bar of the Netherlands. Belgium is the third bar, behind Germany. The first place is occupied by Malta with a value that is going well above the maximum value of the y-axis (450 for a y-axis that only goes to 140 MWh/km2). This goes to the heart of the problem with this kind of metric. Searching for more information on solar energy in Malta, I didn’t really find how much the share is. I did find a 2016 article that Malta is still doing poorly on renewable energy. I also found a wikipedia entry on energy in Malta that the capacity of solar photovoltaic in Malta is expected to be 28 MW … in 2020. That is a yearly production of 0.043 TWh, which is below the BP threshold to be included in the table (0.05 TWh). So it will still be a few years before it even enters the tables of BP. The point is that Malta and Belgium are small countries and densely populated (Malta has a population density of 3 times that of Belgium), therefor a high need for energy compared to the surface area. All energy sources would be amplified when using this metric. According to this metric, Belgium is in the absolute top when it comes to nuclear energy! I didn’t hear the Minister about that. We are in second position, closely behind South Korea and way above the third on the list (Taiwan). We even beat our southern neighbor big times, which only comes at the fourth place despite its huge share of nuclear energy. Eat your heart out, France! Concluding, this is a completely meaningless metric and has nothing to do with policies on wind or solar energy. It is in fact an artifact of our country being rather small and densely populated. This high density means many people on a small surface area needing energy. No wonder we are at the top when it comes to comparing energy consumption per km2. Does the Minister realizes that the comparison he showed is completely meaningless? He should, he is the Minister of Energy, for goodness sake. My guess however is that he didn’t realize it and just shared the “good news” with his followers. Which wouldn’t do him a favor either. I don’t think he is the sharpest knife in the drawer. To me, he seems more like a follower who does what he is told (make the energy transition with solar and wind). As a bachelor in Communications, energy is not his natural environment (confirmed in those two tweets). That shouldn’t be an issue though IF his advisers were energy experts who know the ins-and-outs of Belgian energy, but judging on their degrees (law, political sciences), they are clearly not. Even amongst those qualified in energy matters we find too many zealots for whom the end justifies the means. There is one graphic where Belgium leads Europe. Fig. 2. 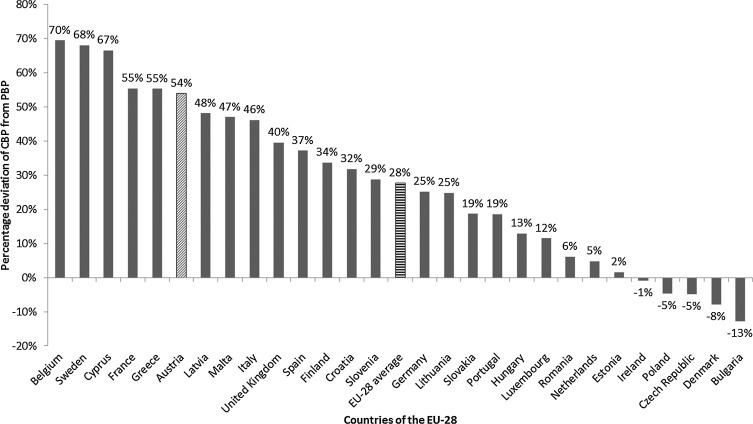 Percentage deviation of GHG emissions following the consumption-based principle (CBP) from those following the production-based principle (PBP) for the EU-28 in 2011. That is Belgium more emissions in the products that it imports than the emissions than the emissions it exports. It might be because it is a service-based economy, with very little heavy industry. Or it might be, like France, Belgium has very low emissions in its electricity generation. The article concentrates on Austria, but is applicable to Belgium as well. One lesson is that if high energy costs drive businesses to India or China, a country’s emissions may decrease, but global emissions may increase. For instance, a steel industry using mostly electricity from nuclear will generate fewer emissions than where the electricity is from coal. Could be both reasons in our case: we are a small, import based country with (currently) a rather clean electricity production.That could change in the future though (our politicians are getting really desperate to get rid of nuclear power to follow in the tracks of Germany).